Kuranda Day Tours from Cairns, Train & Skyrail Day Tours Include Bus pick up and Drop off from your Cairns based Hotel. Enjoy the Kuranda Scenic Rail and Skyrail Rainforest Cableway. 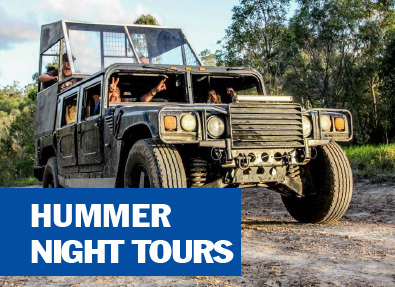 Cairns Hummer Night Tours operate an exhilarating night tour thru the amazing rainforests of Far North Queensland. Enjoy the thrill of riding in an American H1 Hummer. 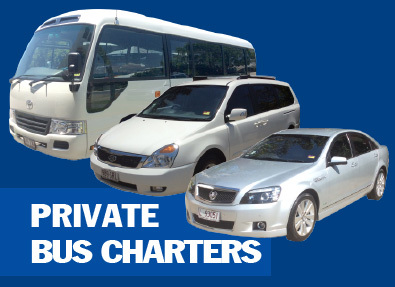 Cairns Private Bus Charters, If you have a group or are a tour operator contact us for your next private bus charter here in Cairns. Professional driver guides! 26 Years Local Experience, We Will Be There for You! International Coaches & Tours is a locally owned and operated coaches and tour operating company based in Cairns, Tropical North Queensland, Australia. Our Managing Director, Ray McIlwain, has over 50 years’ local experience and knowledge of our region. Ray’s well-known, personable style is widely sought after by clients throughout the world. Passengers are instantly relaxed and assured of receiving the best professional and personal attention. Kuranda is a small village located about 1hour to the West of Cairns City. The picturesque mountain retreat of Kuranda Village is surrounded by World Heritage Rain-forest. One of the most memorable days visiting the surrounding rain forests of Cairns is with a Kuranda Day Tour from International Coaches & Tours. As a professional coach touring operator in Cairns we have been offering Kuranda Day Tours from Cairns for over 15 years. With our superior modern fleet of vehicles and professional drivers, we host a variety of Kuranda Day Tours from Cairns. 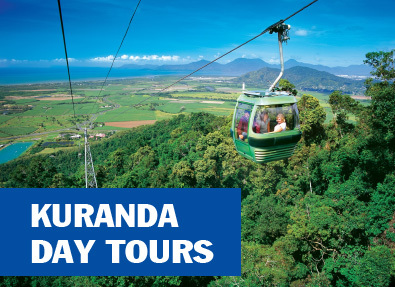 Easily our most exciting and cost effective Kuranda Day Tour is our Kuranda Train and Skyrail Rainforest Cableway Day Tour called the Kuranda T1 Tour. Our coaches and professional driver guide will pick you up from your hotel and transfer you to the Kuranda Train station, here you join one of the most reverend scenic rail journeys in Australia. After arriving into Kuranda Village you will disembark the train and enjoy around 3 hours free time exploring this famous little village. Kuranda Village garnered its name from the hippie markets back in the late 60’s. After your time exploring Kuranda Village its time to join the Skyrail Rainforest Cableway, a 7.5km unique rainforest cableway experience which glides just metres over the canopy of Australia’s World Heritage listed Tropical Rainforests. About 1 Hour 15min to complete a one-way journey. Experience breathtaking views of the Great Barrier Reef, Islands and surrounding valleys and mountains. No trip to Cairns is complete without a visit to Kuranda Village with the Scenic Railway and famous Skyrail Rainforest Cableway. Pick up and transfer to the Hummer site in Kuranda. There you will arrive in the rugged untouched bushland on the outskirts of Kuranda and settle in by the Camp Fire. Try some BBQ Kangaroo Sausages and crododile sausages, roast some marshmallows, share stories and enjoy the Aussie outback life style with some Billy Tea. Then the adventure begins: boarding the almighty American Military H1 Hummer. You are rushed into the rainforest while experiencing the strength of this high performance, off road, all-terrain vehicle driven by your experienced driver / guide. After the Hummer tour, we then travel through the Tablelands to Granite Gorge. Here we are met by the ever friendly little Wallaby, the smallest species of kangaroo-Rock Wallaby in Australia. The wallabies are so friendly they will eat out of your hands! (Food is provided.) If you are lucky you may even see the Wallaby mother with a small Joey in her pouch. Star gaze and explore the skies, including the famous Southern Cross. We also offer Mini Buses, Coaches, Tour Guides, Airport Transfers, Weddings, Tailor Made Tours, Professional, Personalized Charter Bus Service. We recognize how important it is that clients’ and passengers’ needs are meet promptly and efficiently. We are based 3min from the airport and 5min from the city. At International Coaches and Tours, we also offer premium quality car detailing at competitive prices. If you would like to book a tour from Cairns please contact our reservation team on PH: 07 4032 5877 or you may wish to Book Online. Once we receive your online booking information we will process your booking and email your confirmation with pick up time. Open 7-Days Per Week 365 Days Per Year.